Alfredo Rodriguez – Alfredo Rodriguez Trio. This is why relatively few songs are played, but one is completely gratified at the end of the hour-long set. Not before we are treated to two monumentally crafted versions of familiar Latin fare. The first is a breathtaking version of Consuelo Velásquez’s “Bésame Mucho” It comes after a particularly torrid version of Osvaldo Farrés’ “Quizás, Quizás, Quizás”, which melody receives a beautifully severe dressing down from the pianist. The second piece is the one that blows everyone away. It is Eliseo Grenet’s beautiful “Ay, Mama Inés”. Just how difficult it was to create such a sensation may be discerned from the fact that Alfredo Rodriguez had just finished playing his masterpiece, “Yemayá”, a work of such rare and pristine beauty that he happily rouses the sleeping òrìsà from her bed in the depths of the sea. The, just like that, it is over and we are left pondering what just hit us? Well, what actually did was one of the most brilliant young musicians of his generation; one that includes so many stellar names that it would under normal circumstances be hard to pick the leader of the pack. 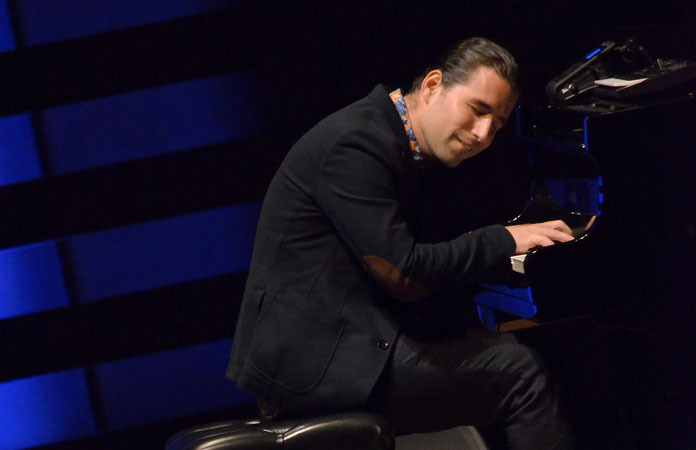 Though, when Alfredo Rodriguez is on song, as he was on this night, everyone else seems like a distant second, vanishing in the rear view mirror of contemporary music because Alfredo Rodriguez has redefined what contemporary music played on the piano ought to sound like. And we are left wondering how things could get any better tonight. As things went they may not have needed to get better, because the wave was still cresting after the intermission. 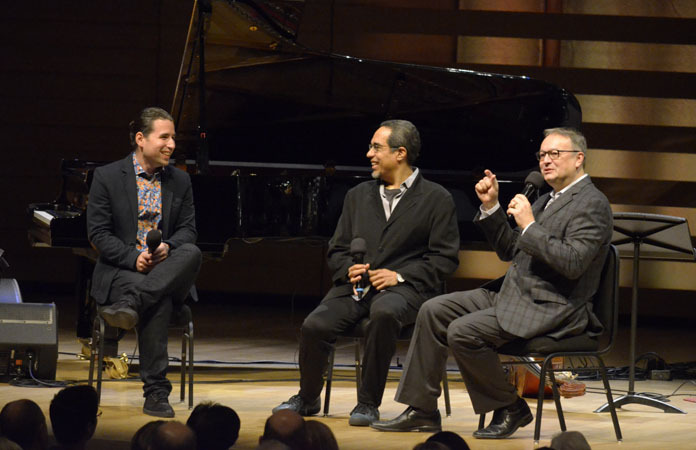 Artistic Director, Mervon Mehta in conversation with Alfredo Rodriguez and Danilo Pérez. 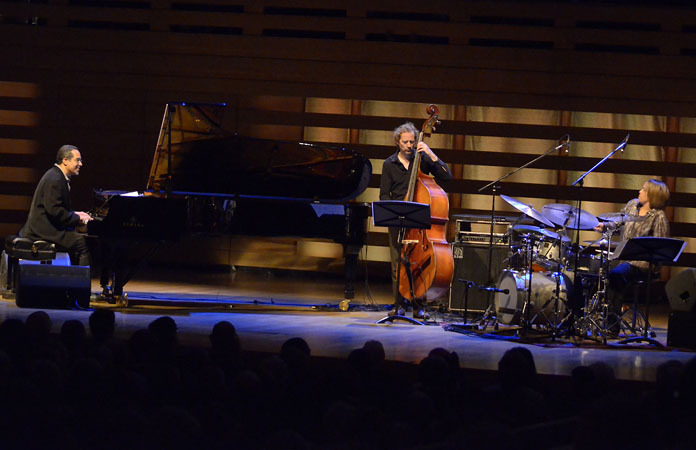 It began with a short three-way conversation facilitated by Marvon Mehta, Executive Director, The Royal Conservatory, between Alfredo Rodriguez and the following performer, the great Jazz musician and pianist, Danilo Pérez. Mr Mehta attempts to provoke a discussion that happily runs counter to the commercial standards plaguing the music arena, overloaded with useless terminology such as Latin-Jazz. The music Alfredo Rodriguez plays, and what just went by, can hardly qualify to be curated under that banner anyway, as is the music that Danilo Pérez will shortly play. 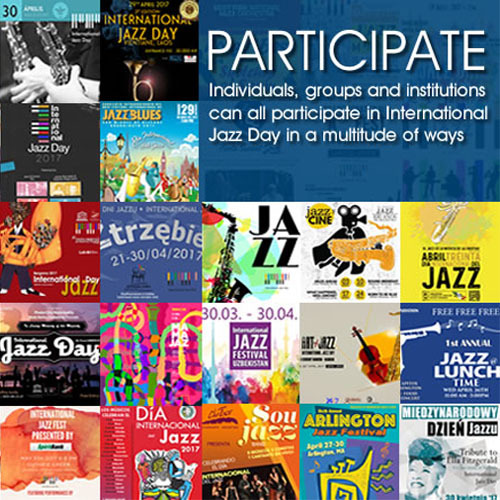 One of the greatest gifts that Jazz – that ubiquitous African-American idiom – has given humanity is that it has become the glue for both unity and change: unity, because it draws men and women across the globe together as one whenever its sounds fill the air; cultures simply collide and even the planet seems small and almost insignificant when this music is played, and change because no one is ever the same once they are touched by Jazz. It is in this context that Danilo Pérez first came to the attention of another Jazz genius – Dizzy Gillespie, who quickly absorbed his immense talent into what the great musician and trumpeter called his “United Nations Orchestra”. The year is 1989 and the iconic pianist is introduced to the world at the Royal Festival Hall in London. The 14-piece ensemble’s masterpiece album, Live at the Royal Festival Hall became a kind of Rosetta-Stone of modern large ensemble music, where the music of many ‘worlds’ literally and magically collided. The spotlight shone on Danilo Pérez as he was featured on such songs as “Tin Tin Deo”, “Seresta: Samba for Carmen”, “Tanga” and “A Night in Tunisia”. Danilo Pérez had arrived in an atomic explosion and he continued to make waves through the bands of Paquito D’Rivera, Wayne Shorter, and, of course, in groups that are uniquely his own. Danilo Pérez Trio – Danilo Pérez: piano; Ben Street: bass; Terri Lyne Carrington: drums. Tonight Danilo Pérez is joined by a familiar (certainly to him) face, and one of the truly heroic and innovative voices in music, the drummer Terri Lyne Carrington and bassist who is, as it turns out, a complete master of the difficult-to-master bass-violin, Ben Street. Danilo Pérez announces that he will be revisiting his 1996 masterpiece, PanaMonk, Mr Pérez’s profound meditation on the music of Thelonious Monk. It also seems appropriate that this should be the music of that deep-dive into Mr. Monk’s music and its effect on all music especially as 2017 is the centenary of Thelonious Monk’s birth. The set, however, begins under the softly dimmed lights that wrap themselves around the lone figure of Danilo Pérez as he begins to meditate on the meaning of Thelonious Monk’s music in 2017.